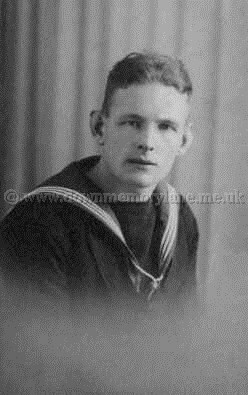 This portrait photograph of Sammy White was taken during the Second World War, the year is unknown. 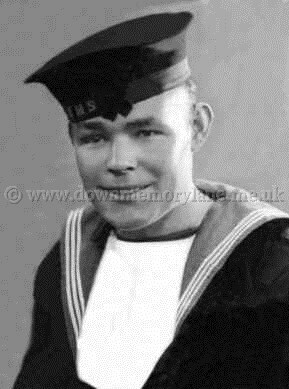 You can tell it was taken during the war as the name of his ship is not on his cap so nobody could tell what ship was in port. 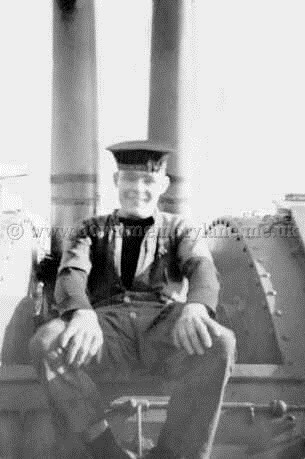 This is Sammy White relaxing below the twin barrels of a gun emplacement aboard H.M.S. Triumph, the year is unknown. This portrait photograph of Sammy White was taken in December 1937. Here we have Sarah Woods getting her portrait taken in the studio. Just look at her blouse, remember all handmade with matching material buttons and two brooches. The year is unknown. 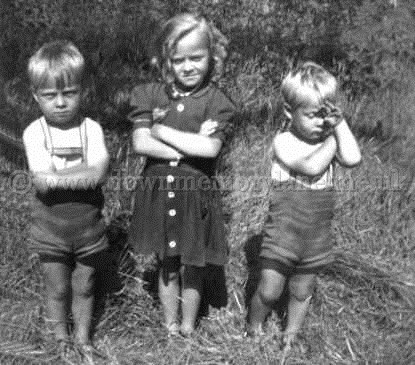 Standing in the field in 1953 with his arms folded is Gerald Scott, next to him is his sister Doreen and beside them not wanting to play is Tony. Standing outside O.C. 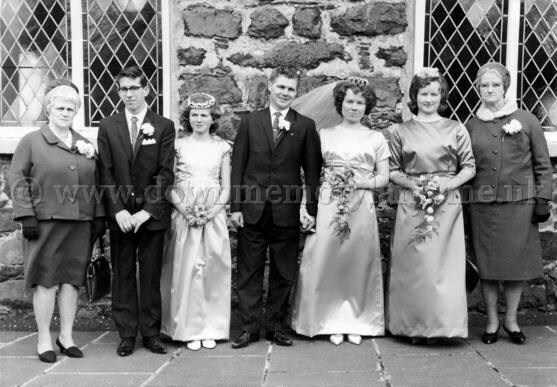 Church Randalstown on the 26th February 1966 we have the Smyth Wedding Group. From the left, Groom's mother Bertha Smyth, Best man Eddie Trimble, Bridesmaid Janett McDowel, Groom Jim Smyth, his lovely Bride Elizabeth Lindsey, her sister Margaret Lindsey and her mum Mrs Lindsey. I wonder what is in the tent behind Jim Smyth from Randalstown. 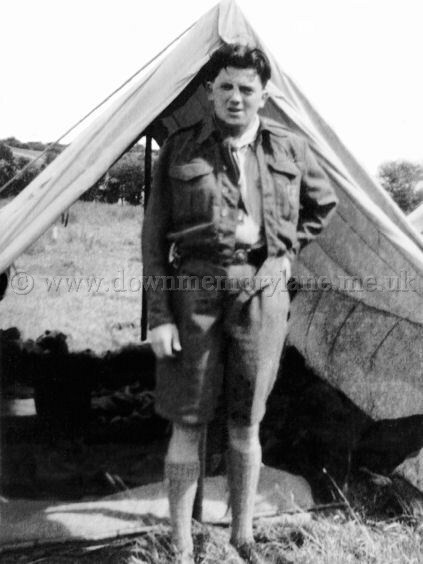 Jim was in the Royal Irish Fusiliers serving in Kenya in 1954. 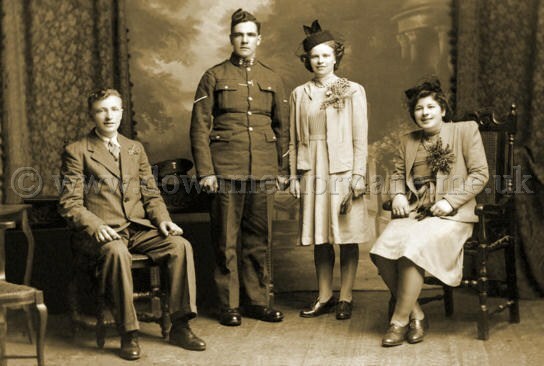 It's 1943 and we are here in a studio for a wedding photograph to be taken. On the left is the Best man Willie John McDonald, Groom Andy Selfridge who was in the Royal Irish and a corporal, his lovely Bride Lizzie McDonald and finally Bridesmaid Rachel Selfridge. These five riders checking all is ok before the start of the race. 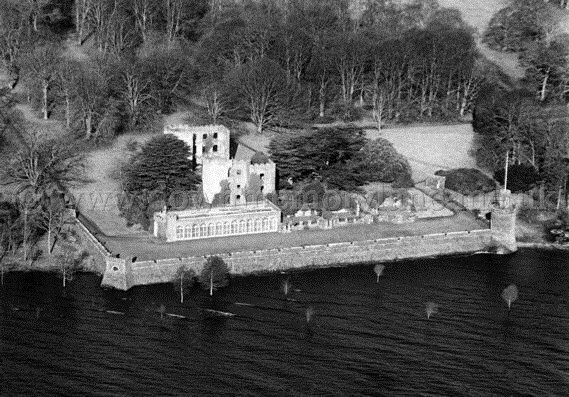 It was being held on Lord O'Neill's land at Shane's castle. who they are or when the event was held is unknown. 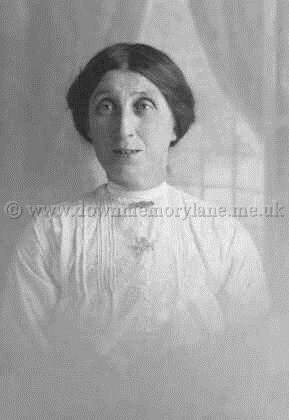 This is Bertha Smyth out at Randalstown, being the proud grandmother that she is. Bertha could not resist the chance to show off her Granddaughter Roberta back in 1969. 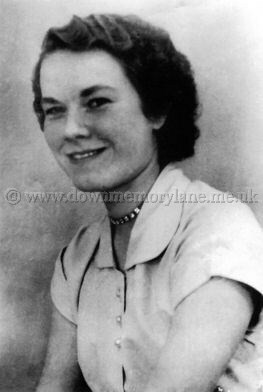 This is Elizabeth Smyth from Randalstown whose maiden name used to be Lindsay. Now to get those waves in her hair the ladies used to used wave grips. They were about six inches long, slightly curved and teeth on them that would have bit into your finger quite easily! This part of the castle is called the Banshee Tower. 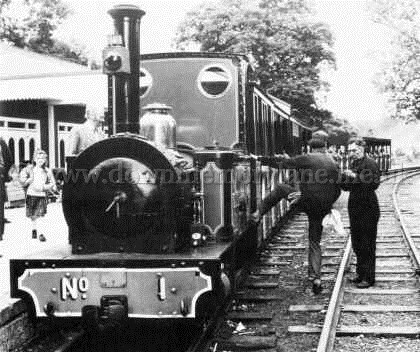 Here we have at the time Egar Wallace Antrim's Lord Mayor and Lord O'Neill on No.1 train. Sitting on the side of the trap is the Hon. 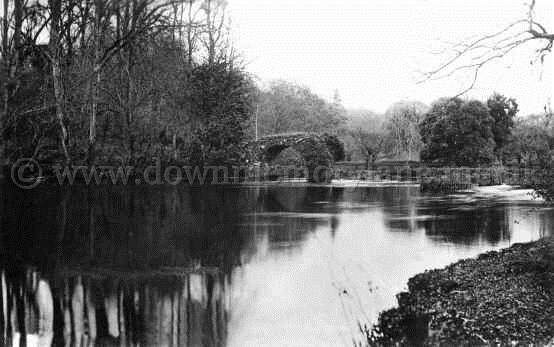 Arthur O'Neill just off the Randalstown Road in Shane's Castle grounds in 1908. 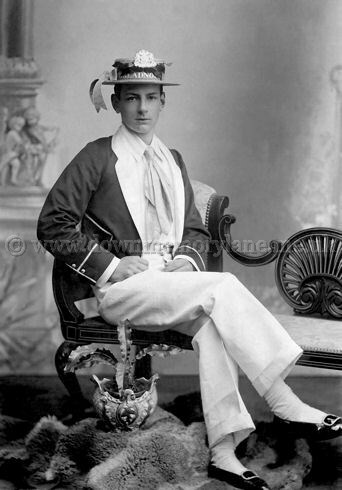 It's November 1903, a bitter cold day looking at the mens upturned collars as they get their photograph taken during the Vice-Regal's visit to Shanes Castle. From the left we have the Hon R. O'Neill, Major Bonns, Mr Cecil B. Pape, the Hon A.O'Neill, Lord Mandon, Lord Lieutenant, Hon Gerald Ward A.D.C., Mr Bruce, Mr Gurney A.D.C., Captain Hope, Lord Plunket and finally Lord Ardee. 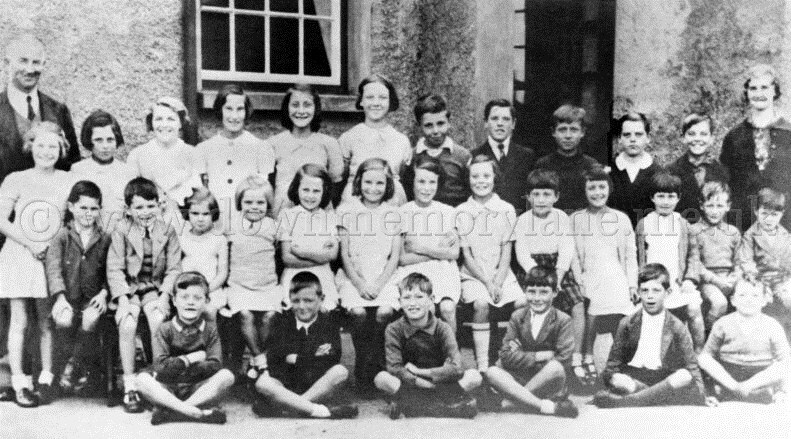 All smiles for their annual school photo we have Shane's Castle Primary School class of 1940. The two teachers are M.McKittrick and Miss McClean. Amongst the one's standing are B.McGarvey, T. Scott, G. McDonald, B.McDonald and J.McDonald. Scattered amongst the pupils seated are J.Smyth, B.Waddell, F.Waddell, C.McDonald, N.Finlay, M.Moore, S.Moore, S.Stevenson and M.Smyth. In front we have (from left) T.McDonald, T.Rodgers, J.Stewart, T.Finlay, A.Moore and W.Clyde. 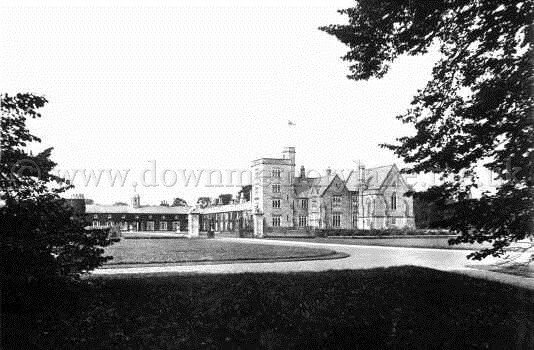 The school was originally opened solely for the children whose parents worked on the Shane's Castle grounds. 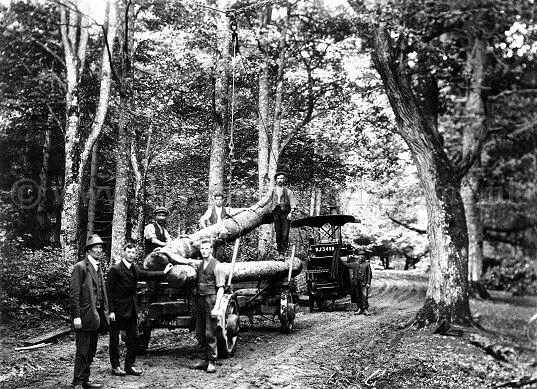 Taken in the 1900's in Shane's Castle Grounds, these men work for Rea's Saw Mills in Castle Street Antrim. See how they are loading the trunks onto the trailer using a block and tackle fixed to trees either side of the track. The lifting of them is done by using a winch which is on the traction engine in front - note the solid wheels on the trailer. 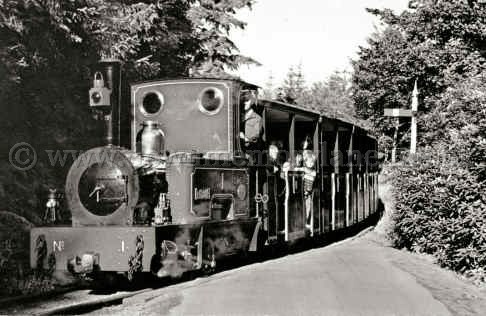 The engine is Garrett built in Leiston, Garretts were very popular for timber hauling and they were also favoured by John Harkness Belfast who used them for haulage around H&W, the docks ect. 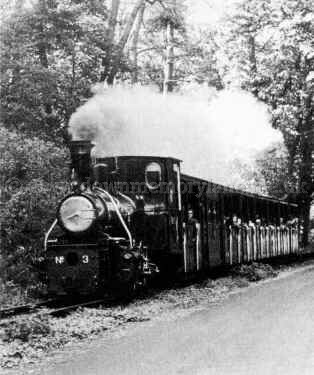 All set for the return journey is engine No.3. It's the end of a hard day and the carriages are being put away for another day. 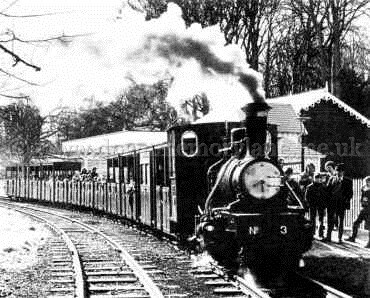 Puffing along under a full head of steam is No.3 engine with its carriages full. The year is unknown. Dreaming of becoming an engine driver this young lad looks on hopefully. to the entrance. This was taken in the 1960's. 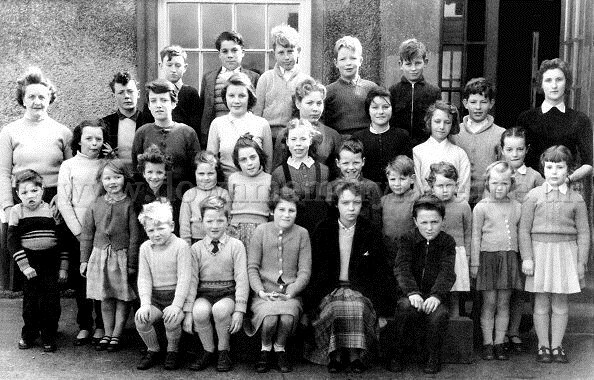 Here we have Shane's Castle Primary School class of 1959. 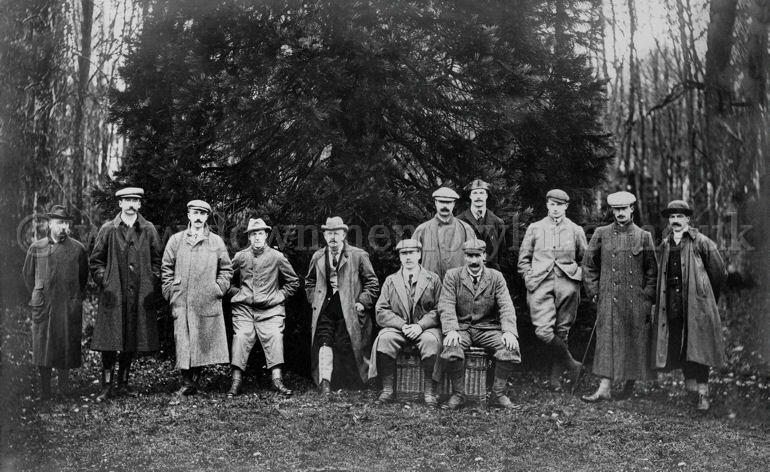 In the back row are John Allison, Unknown, Paul McDonald, Ernie McBurney, Bertie Smyth and Unknown. Middle row we have Mrs Masie Sharpe, Unknown, Miss Warwick, Doris McDonald, Miss McDonald, Sam Moore and Miss McLoughlin. Standing in front of Mrs Sharpe in the front row is John Hurl, then Sharon Simpson, Pearl McDonald, Sharon Simpson, Doris Simpson and at the far end is Miss Smyth with pigtails Seated in front we have Michael and Jan Young and the far end Wilbert Allison. Two of the parents of these children worked at Shane's Castle, one was the Head Forester and the other Mr. Miller was a Shepherd. This Shane's Castle Primary School were not only did the children of the people who worked at Shane's Castle go but also Lord O'Neill's children. 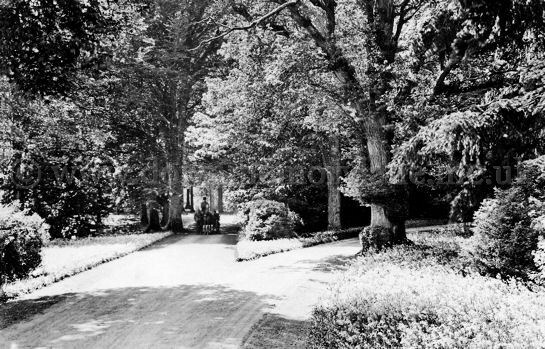 This is part of the grounds at Shane's Castle in the early 1900's and as you can see they are well maintained and lovingly looked after. Grouped in the front entrance of Shane's Castle in 1903 we have these ladies in such beautiful outfits and a Gentleman getting their photograph taken. From the left at the back we have Lady Annabel O'Neill, Lady E. Cochrane and Henrietta O'Neill. 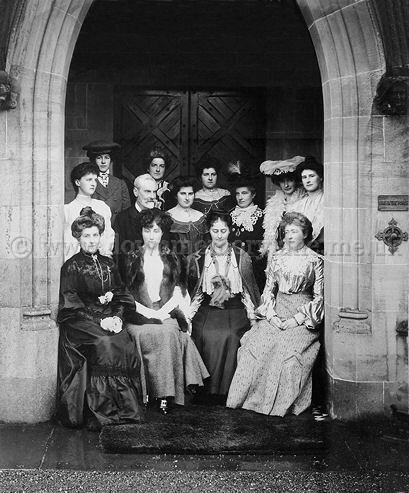 The middle row has Miss Dillon, Lord O'Neill, Rose O'Neill, Anne O'Neill, Lady Margaret Sackville and Miss Louisa Cochrane. Seated in front are Lady O'Neill, Lady Dualey, Lady Ardilaun and Lady Bandon. 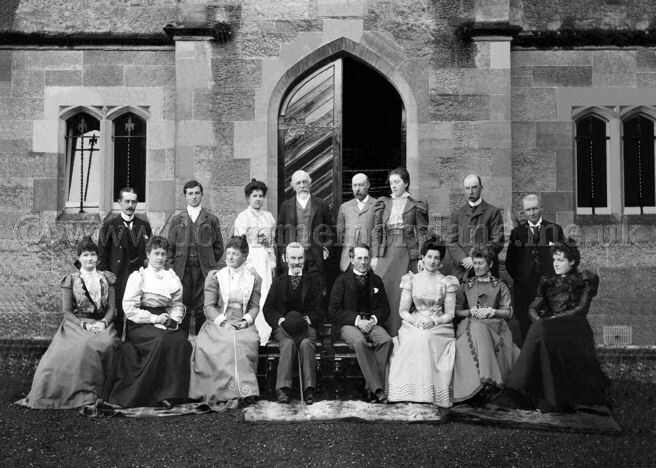 This group photograph taken in 1897 was to celebrate the visit of Their Excellencies Lord and Lady Cadogan to Shane's Castle. At the back on the left is the Hon Gerald Cadogan, Hon Arthur O'Neill, Hon. 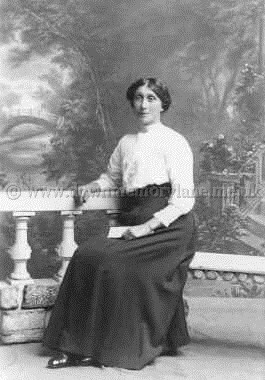 Henrietta O'Neill, Marguis of Dufferin and Ava, Hon. R. O'Neill M.P., Lady Gertrude Langton, Earl Temple and Sir William Kaye. Marchioness of Dufferin and Ava and Lady Magheramorne. There is nothing nicer than the smell of newly cut hay and of course like these three girls and the goat it's lovely to lie on. 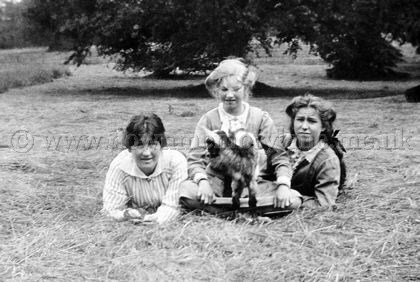 The girl in the middle is Mini but the other two plus the goat are unknown. 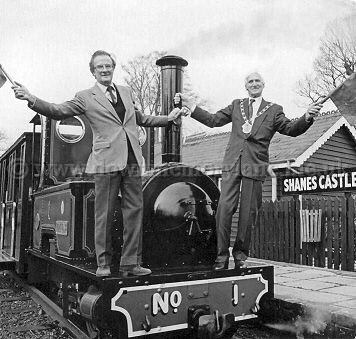 Standing in the inner courtyard at Shane's Castle we have Quinten and Colin Dodds, the year is unknown. 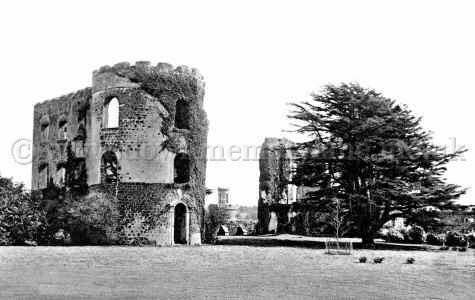 This photograph of the ruins Shane's Castle was taken before Lough Neagh was lowered for a second time. Before the water was first lowered it used to be another 20 feet inland and to the right of the castle they had an inlet with boats there. 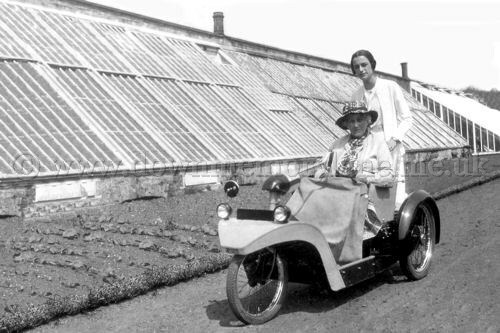 These are the greenhouses in Shane's Castle grounds and stopped beside them in her petrol driven mobility chair is Lady Dunleath and behind her is Daphane Mullholland.. 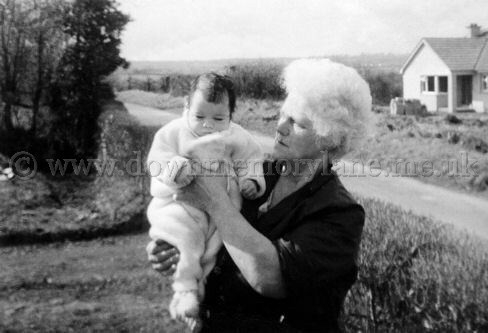 Here in her front garden Connaught Road Randalstown in 1969 is Bertha Smyth. Holding on to the apples of her eye, her grandchildren David and Amanda. 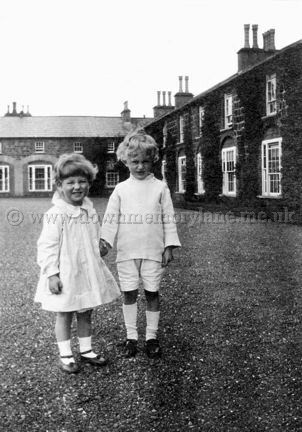 Here we are in the back field of the Smyth home on the Connaught Road Randalstown in 1950. 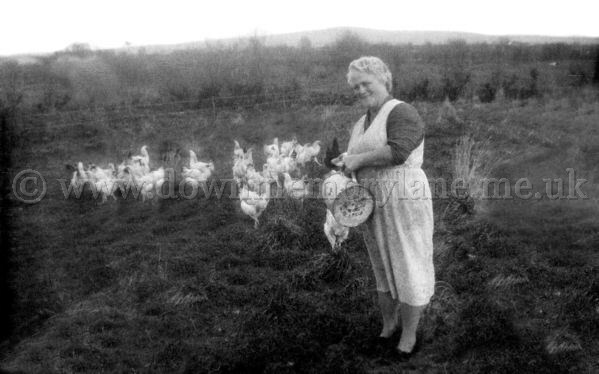 This is Bertha Smyth feeding the chickens, so nice fresh eggs every morning! 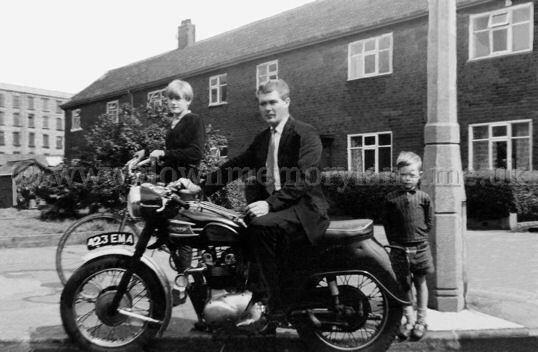 Sitting astride his beloved motorbike is Jim Smyth in 1959. Now Jim who hails from Randalstown but at the time of the photograph was at Stalybridge in Manchester. 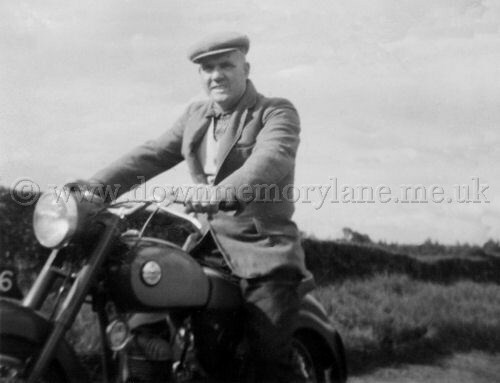 Sitting astride his son James motorbike is his father Charlie Smyth at Connaught Road in Randalstown back in 1951. 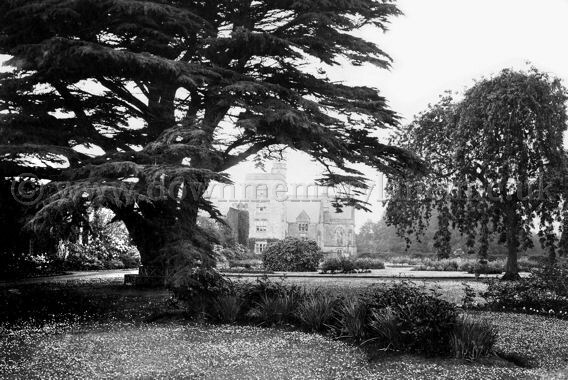 This photograph of Shane's Castle taken from the garden lets you see how lovely they were then. The lawns a beautiful carpet of daises and a garden seat all round the tree so you can see in the shade and enjoy the beauty of the flowerbeds to the left a credit to the gardeners. 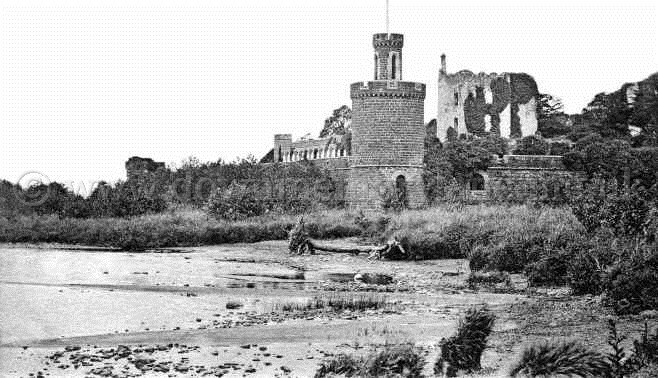 Sitting on the sand banks just below the ruins of Shane's Castle in 1939 is Nanny with Fiona. 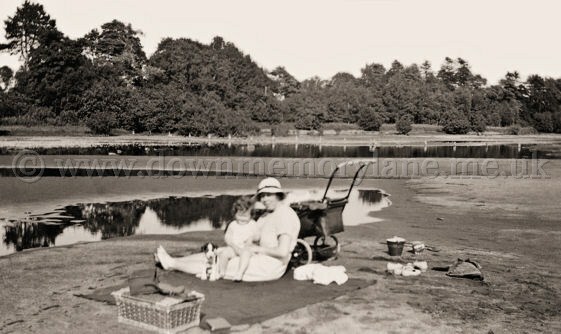 Nanny had brought Fiona down for a paddle and a picnic and also the puppy. Here in the grounds of Shane's Castle and coming up the tree lined road is a team of horses and a coach. 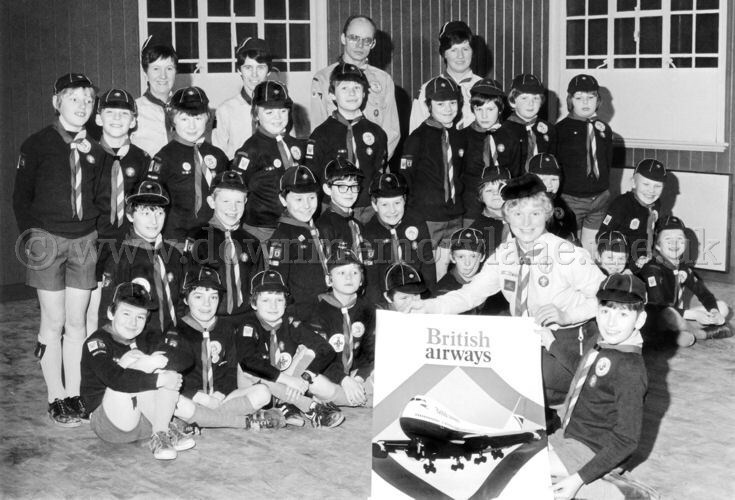 These Randalstown Cub Scouts are full of smiles for the camera but also because they were at Heathrow Airport London after winning the Tea Making Competition in the Northern Ireland region on the 15th January 1983. At the back are the Cub Leaders Freda Watson, Susan Logan, John Logan, Margaret Moore in the front is Betty Mawhinney with cub scout Rodney Moore. Also there are Alastair Todd, Stewart Cameron, Francis McGrath, John Hurrell, Edward Totten, Paul Herron, Geoffery Hamill, Michael Adair, Barry Skelton, Alastair Arrell, Jonathan Turner, Darren Logan, Mervyn McWhirter, Jason Watson, Glenn Logan, David Surgenor, Stephen Ewart, Colin Gilbert, Paul Kelly, Kenneth Small, Mark Waddell, Ian McClean, Michael Allen and H Stewart. 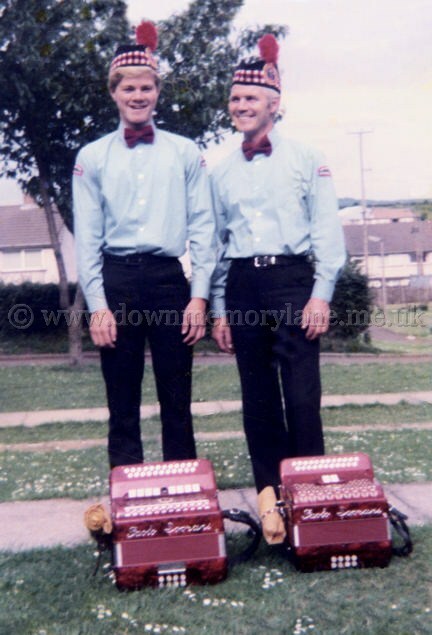 Here are to members of the Staffordstown Accordian Band in Randalstown in 1984. They are Jim Smyth and his son David Smyth. 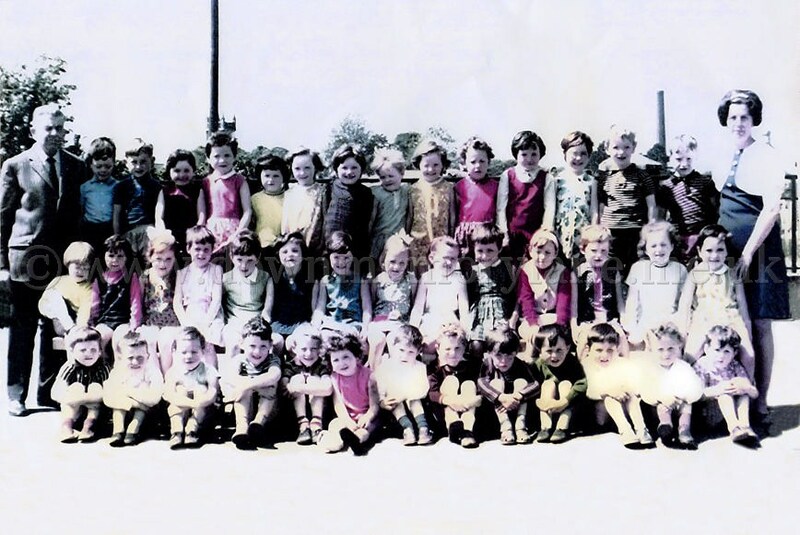 Here we are at Saint Macnissis Primary School in Randalstown P1 class of 1970 pupils all eager to get their annual photograph taken. At the back is the Headmaster Barney Dowds, Harry McCavana, John Gribben, Siobhan McGroggan, Una Devlin, Patricia Magill, Christine O'Kane, Mairead Orr, Angela Magill, Carol O'Kane, Geraldine McCavana, Mary Loughran, Brenda Murray, Dominic McLarnon, Damien Dowds and Teacher Maureen McErlaine. Maureen's head must have been turned for there are three sets of twins in her class! In the middle row are Rosaleen Summers, Eileen McKeown, Elizabeth Hughes, Fiona Robb, Aine Totten, Catrina McAteer, Fiona Martin, Marie Robb, Dawn Clugston, Bridget McKee, Frances McCoy, Bernadette McKee, Una Hurrel and Maria Brown. In the front row we have Michael McCormick, Sean Kerr, John Reynolds, Sean Devlin, Anthony Toal, Louise McKenna, Eamon Kerr, Gerard McLaughlin, Dennis Carey, Thomas Dobbin, Colm O'Boyle, Seamus Martin and Paul McCollum. Here we have Sir Hugh O'Neill at Eaton in Windsor in his younger days. He is dressed in his boating attaire and his boater (hat) has the on it the word' Dreadnought' perhaps referring to the Royal Navy battleship. Sir Hugh eventually became Sir Hugh O'Neill and was the first Speaker at Stormount in 1922, Sir Hugh later went to the House of Lords and became Lord Rathcavan and lived to just over 100 years. 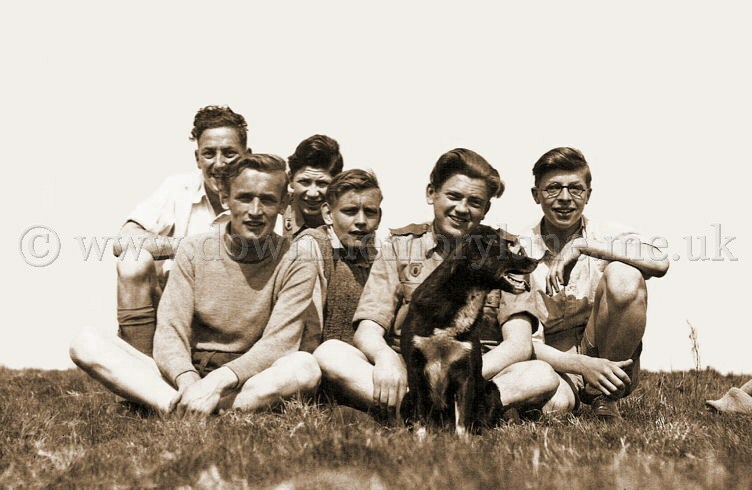 Summer time in 1948 and these Rover Scouts are having a great time at their camp at Ballycastle. 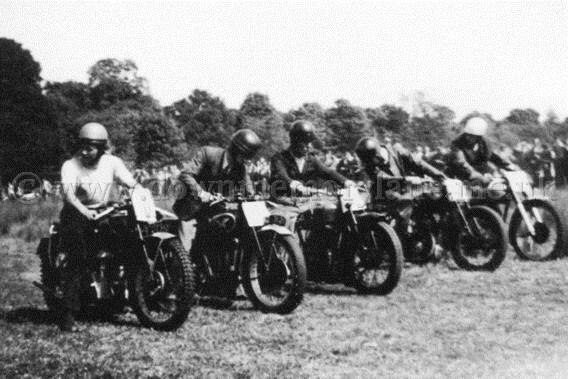 At the back we have Unknown and Pat Gardner while in front are Noel Craig, Ernie Craig, Jim Clarke and Willie Mawhinney. The dog's name? Yes for once we have it, the dog was called Raf after the Royal Air Force. 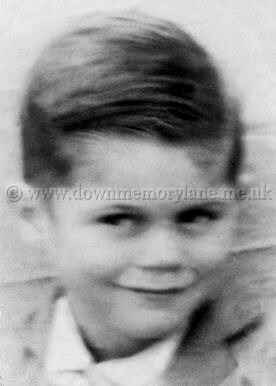 This young lad is Jim Smyth who lived out at Barnish Randalstown in 1939. 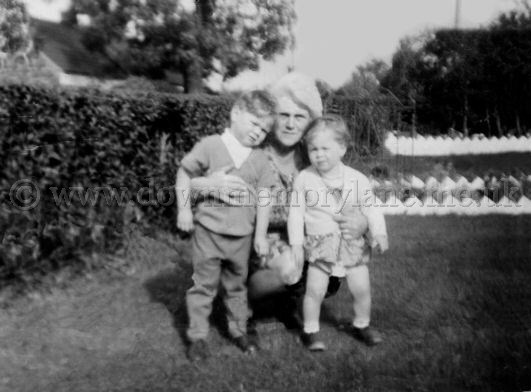 The reason it is slightly blurred is that it was taken with a box camera which had to b kept very still. His mum who took the photo had the great foresight to know photographs can last a lifetime. So his mum saved her tea tamps and was eventually able to buy the camera! 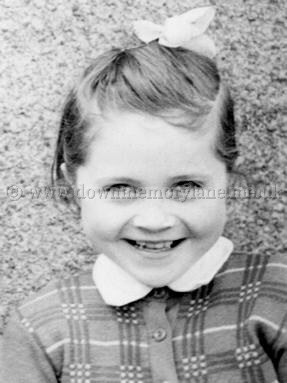 All smiles for the camera is Jean Smyth back in 1959 at Barnish Randalstown. 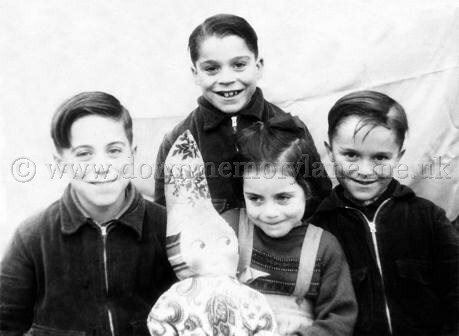 Here we have the Smyth children John, Bertie, Samuel and Betty with what looks like a Russian type doll back in 1954. 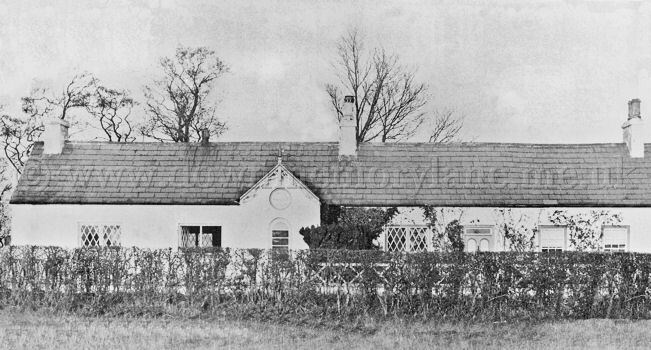 The Smyth family lived out at Barnish Randalstown. 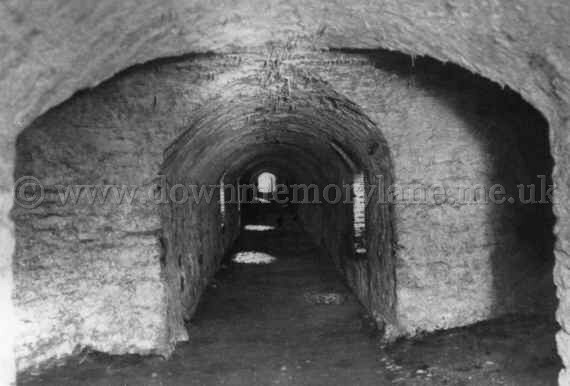 The castle was built in the early 1500's and was lived in until about 8pm on the 15th of May 1816 Lord O'Neill who was dining with some friends was informed that a fire had broken out in one of the chimneys at the North end of the castle. They tried to get to the fire but they were beaten back by the smoke and flames. They soon realised that the fire was too big and started to save items from the castle. At 2am the fire was so intense that the whole of Lough Neagh was lit up and by morning it was in ruins. It was reported that the family Banshee was seen hovering above the flames. 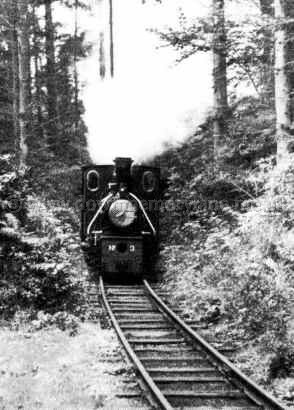 This is No.3 engine steaming out of the forest at Shanes Castle. The year is unknown. Shane's Castle with its grand entrance and clock tower in the background. This is not the original it stands on the shores of Lough Neagh, it caught fire accidentally. The second one built was burnt down deliberately. The year this photograph is unknown. 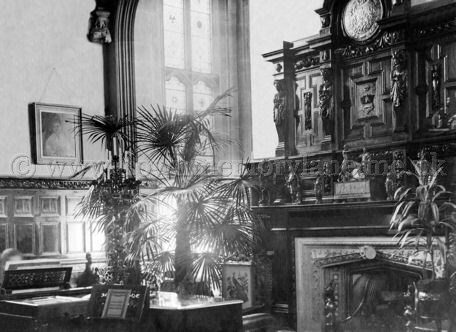 With the sun's rays coming through the stained glass window and flooding the Chapel room at Shane's Castle, to the right is a beautiful ornamental fireplace.Over to the left is someone playing the piano, perhaps to entertain guests or just for their own pleasure. 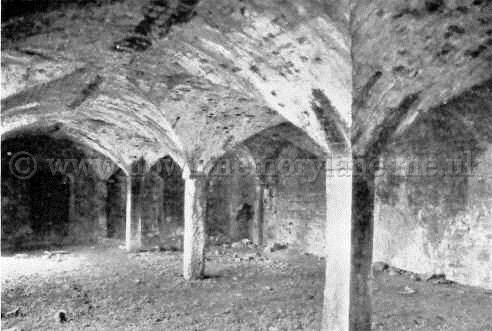 These are the vaults at Shane's Castle photographed in the 1950's. 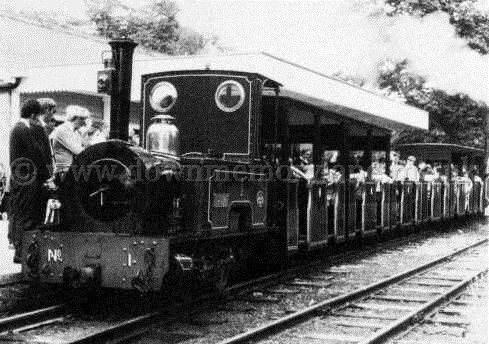 All set to go is No.1 engine with a full load of passengers. 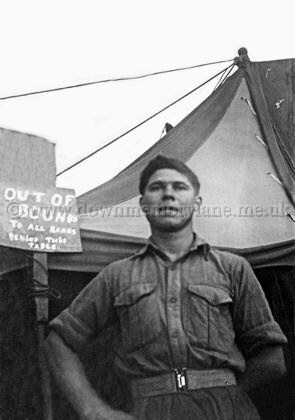 Standing outside his tent at Ballycastle in 1948 this scout looks like he has just got up, now if you know him please let me know. 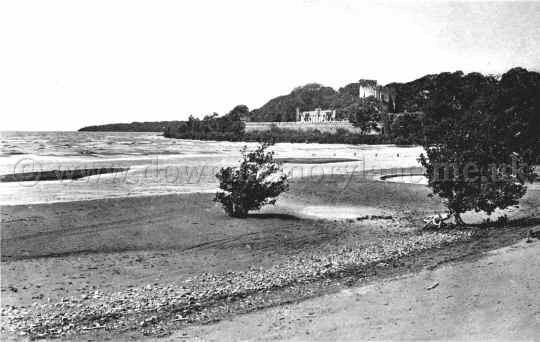 This was taken on the shores of Lough Neagh looking towards Shane's Castle. 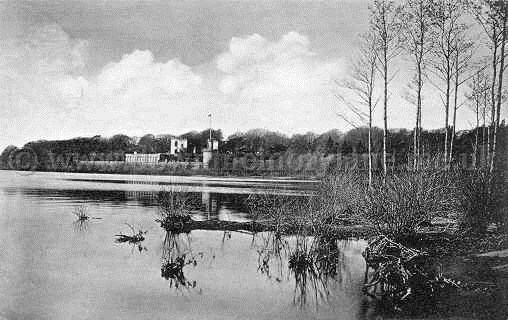 The photograph was taken before the Lough was lowered. 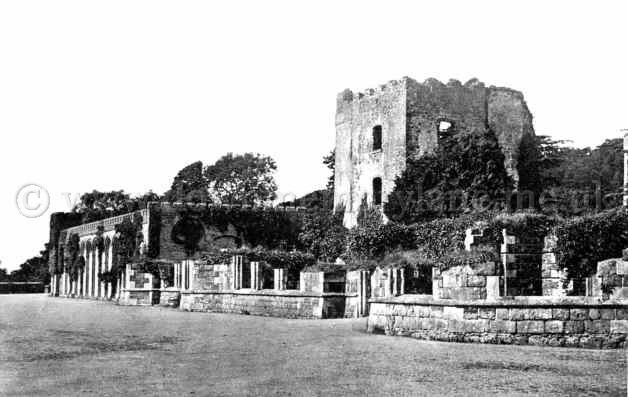 The year is unknown but Shane's Castle at this time was very badly neglected. 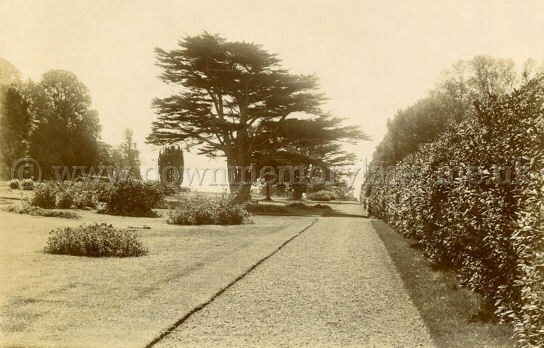 This lovely shot was taken in the grounds of Shane's Castle in 1918. The small building at the other side of the stream was called the Egg House.With the exception of the roof, the beautifully designed structure was made of wood. This image proved so popular that it took on a new life as a postcard - and the message on the flip side of this card also harks back to a simpler time. It was posted in Toome, to a young lady who lived at 'The Factory' in Antrim town in 1919. The charming message reads:' Dear Annie, just a few lines to let you know I received you P.C. alright. I wasn't at Cloughfern. Hope you enjoyed yourself and got plenty of boys. Tell Alex I was asking for him xxxxxxx. Cassie hasn't wrote to me for a long time. Hope you will soon be coming down. Sarah'. 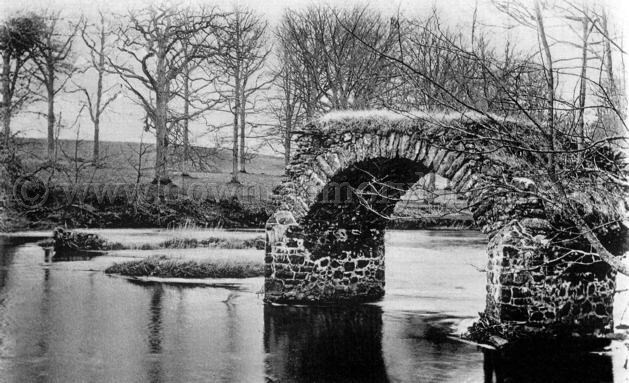 This ruined bridge was photographed in the grounds of Shane's Castle. 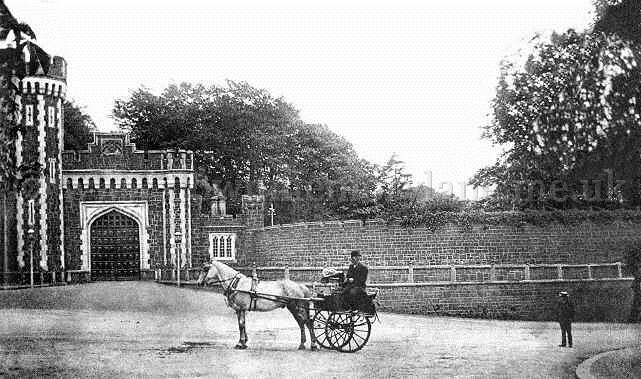 This is the main entrance to Shanes Castle and out in the middle of the Randalstown road on the horse and trap is a man you were either glad to see or dreaded seeing! 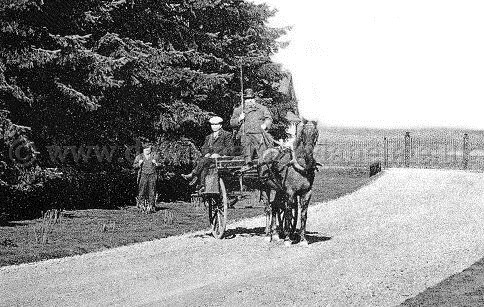 It is Doctor Stewart and the other man standing in the road is Willie Irvine, when it was taken is unknown. 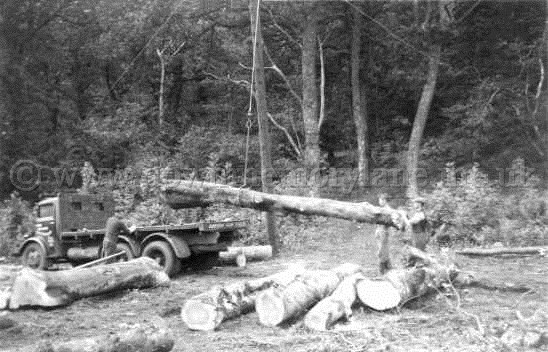 Giving a hand to load the tree trunk onto the lorry is Robert Crawford Rea on the 20th September 1949. 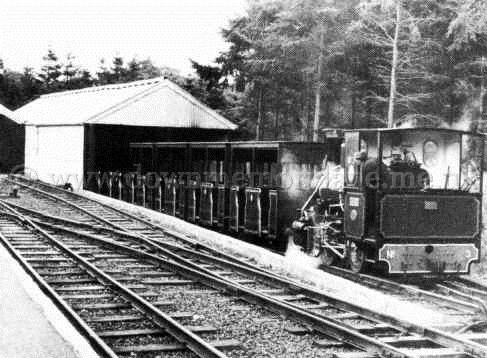 The photo was taken in Shane's Castle Grounds apparently to show Crawford in the unusual role of working! 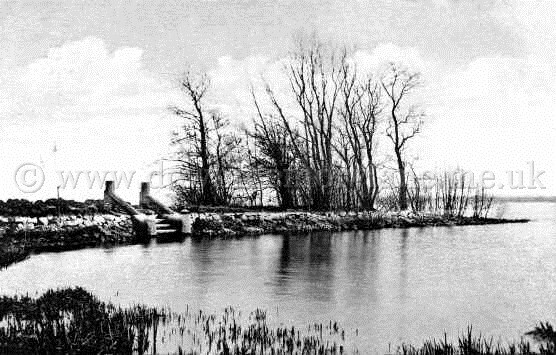 This is the Pier at the Rockery on the shores of Lough Neagh in 1915. The postcard is stamped Randalstown, 2nd December 1915. To: Miss McGrath, 26 Riverside, Antrim. Reads: Do you know this place, were you ever here. Edd. KEB also T.T. 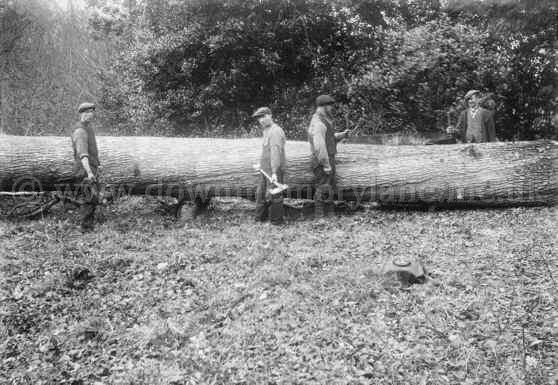 Getting ready to cut the fallen tree in Shanes Castle grounds on the left is Henry Fleming, the rest of the men are unknown. As you can see by their tools it was going to be a long hard day. 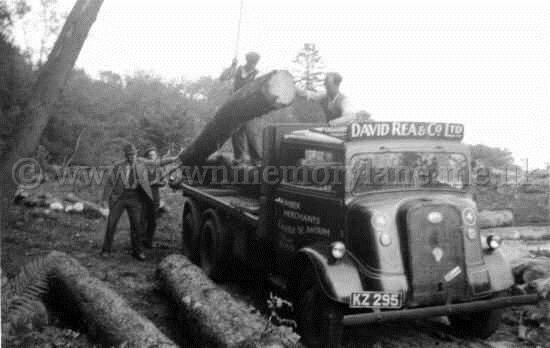 Somewhere in Shane's Castle Grounds on the 20th September 1949 we have David Rea's men loading up the lorry with trees to take back to the mill in Castle Street. How they are lifting them unto the lorry is by a block and tackle attached to the pole and the pole could be lowered forward and to lift the trunk higher the men pulled on the ropes attached to the top of the pole. 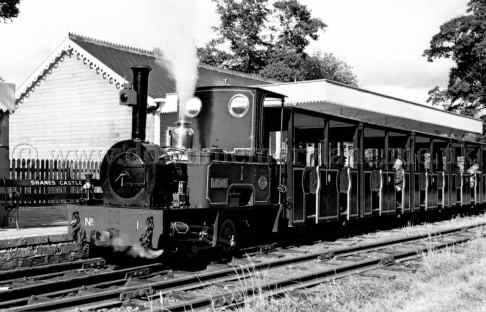 Here we have No.1 train just arrived at Shane's Castle Station and they will now uncouple the engine to make the return journey to the entrance. Taken in the 1960's. 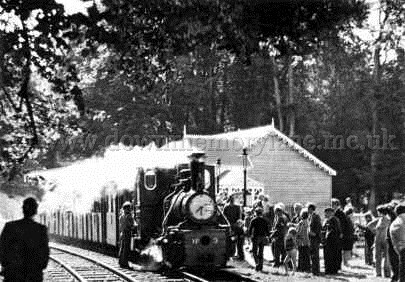 A familiar sight for many a year was the steam train and the driver in the photograph then was Nick Watson. The trains are no longer there but you can still see the train as it now runs from Bushmills to the Giant's Causeway during the summer. 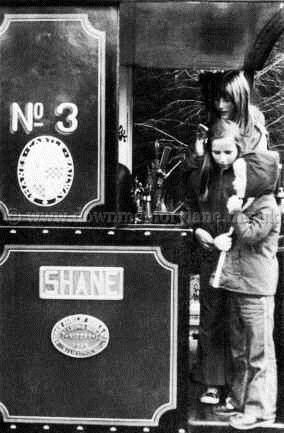 All set to take its passengers up to the ruins of Shane's Castle on the shores of Lough Neagh is engine No.1. The year is unknown. 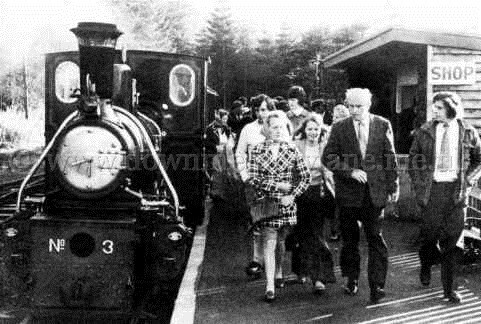 Passengers leaving the train after being to Shane's Castle. 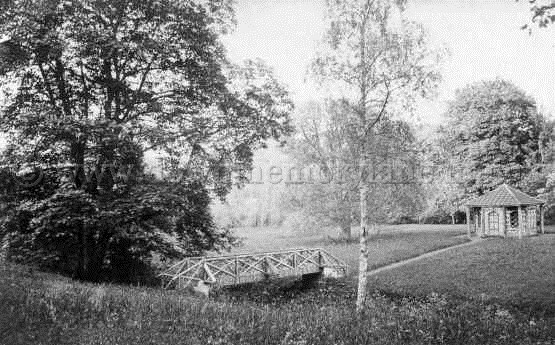 This is all that remains of the bridge which spanned the Maine river at Demesne in Shane's Castle grounds.